) and I have been threatening to get together with our kids. We all love to talk writing, and we all have energetic six-year-old daughters.
) 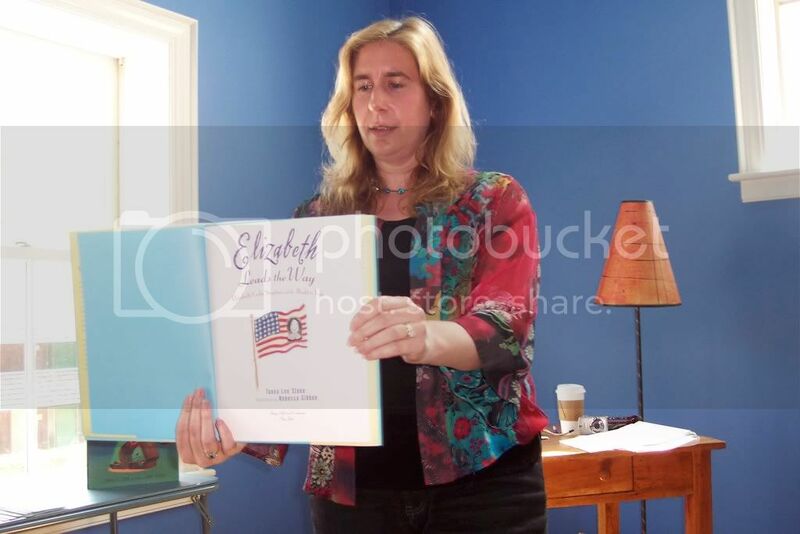 gave us the perfect excuse this past weekend — a book launch at the Flying Pig Bookstore for her new picture book biography, Elizabeth Leads the Way: Elizabeth Cady Stanton and the Right to Vote. Tanya kept us captivated with stories of how she wrote this book, how Rebecca Gibbon’s charming illustrations evolved, and how the early drafts of those illustrations sent Tanya back to the research phase of the project again and again. The result is a truly spirited book about a woman who deserves to be a household name. E and I have read our copy five times since Saturday. Every time, Elizabeth Cady makes us smile with her determination. The rest of the day passed in a blur. There was a long pizza lunch. The girls colored; we talked. There was a meandering trip through the beautiful Shelburne Museum. The girls ran through the grass, asked questions, climbed trees, worried the security guards at times (they weren’t going to touch those Monet paintings…they were just pointing…), and made fast friends in the way that only children and people who write for them can. The day passed so quickly that we barely caught the last ride on the carousel before the museum closed. There was no music, so we made our own — a rousing version of “Take Me Out to the Ballgame.” The lady running the controls sang along. In other company, it might have felt corny, but with the six of us going up and down and round in circles in the late afternoon sun, it was a perfectly fitting way to end the day.